The day prior my brother raced and completed is first normal sprint triathlon. Now I had a race of my own. I was gonna pee, gosh darnit. After several attempts the day before with no success and the unpleasant use of a catheter. I was ready and I was gonna win this race. I whimpered my way to an upright position then slowly and with a grimace I eeked to a standing position. I wheeled my IV pole to the bathroom, lifted the thin vail that covered my special region and pushed like the dickens….. nothing! I was bummed. I was not ready to give up, so with steadfast effort I leaned against the wall and gave it the old steady sustained push and eventually a small dribble turned into a glorious stream. It was relief to my ears to hear the sweet sound. I exited the bathroom, hunched over with stomach pain but arms raised in celebration, fully filled bottle in one hand and my IV pole in the other. Very rarely have I ever experience such joy. I quickly thought the hospital staff wouldn’t appreciate a crazed patient fist pumping his own urine in the hallway. So I quietly returned to my room, set my bottle down where the nurse could see my success and went for a victory lap around the hospital. I like to think the hospital staff could see the joy in my eyes but they probably felt sorry for me with my hunched shuffle walk. I returned to my bed and my Dad came. He gave me a fist bump after seeing my proudly displayed bottle and we knew it was only a matter of time before I would be out of there. While I didn’t get to race in San Luis Obispo, I think I got that sense of accomplishment that finishing my first normal triathlon would give me. Even though it was a bit unorthodox, I finished my race and I was proud of my brother. Now, well after two weeks of light exercising (doctor prescribed), the Running Brothers will be training for their next event. I was stuck to a bed in French Hospital and my brother was about to start the SLO Triathalon. I was going to missing my brothers Race. My sister managed to find an Application (Qik Video) for ourAndroid Smartphones which was like a video calling application and as my brother started the race I got an alert from my sister. After acepting the alert I was pool side, hearing the splashes and seeing my Brother completethe 36 laps in the pool. He was looking good and halling but especially when I compared him to his lane partner (an elderly lady with a good kick and medicore swimming form). To save her phones battery my sister said she would check in with me every so often as the race progressed. It looked like such a wonderful day, I was stuck in a hospital bed and it was so great out. Zeb finished the swim and I got my next alert from Lacey. I watched Zeb on his first transition to the bike and watched him pedal off out of site to Orcutt Road. Lacey’s phone died after that but Zeb looked good and I knew he would finish. After about an hour my Mom came into my room and told me my brother would be running infront of the hospital. I had an urge to get up and see if the staff would let me out the front door to watch him but, by the time I knew he was close it would have taking me a good 30 minutes to get disconnected from everything and out the front door. He passed the hospital and went on to finish the race. He must have immediately crossed the finish line, loaded up his bike and came to the hospital. He was there very quickly with my whole family. He gave me his metal and I got to ask him about the race. He said it was tough and a lot more difficult than he expected, even slightly boring. I wish I could have ran with him to keep things more lively. My brother did great and I am really proud of him. With less than 24 hours the start of the the SLO Triathalon where Rocky is going beat Zeb, Rocky is consummed with stomach pain. After a few hours of resting with stomach pain and no fever the Running Brother Family meets and decides it would be best for me to see a doctor. My family is absolutely fantastic, they were all immediately on the phone trying to find a place for me to see a doctor without voiding my health insurance. Very quickly we determine their is no Kaiser on the Central Coast and French Hospital is the nearest facility for me to get a check and a quick dose of something to get me ready for my big race. The CSPA workshop was having their 60 Anniversary gathering. Where my Dad and my number 1 hero was named to the organizations Hall of Fame. My Dad, Brother and Sister go to the Anniversary and my mom and I are headed to French Hospital. My mom and I walk into the ER doors and immediatly are talking to the check in desk folks and they immediatly get us to a bed, within 15 mins of walking in the doors our doctor was at talking to use and attempting to diagonis the problem. He quickly orders a Cat Scan which is completed and sent to the Radiologist. Within minutes we would have our answer and I was hoping to get a shot or parscription and be out of there. 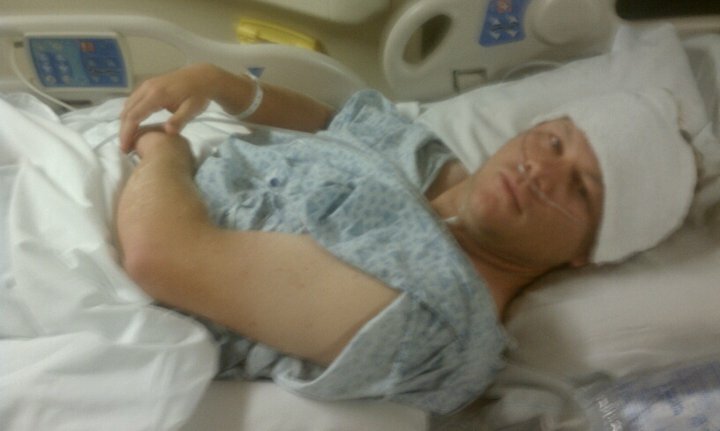 Unfortunently it was not my day… I had an appendicitis which required surgery. My race was over and hospital stay was going to be a lot longer than originally desired. Fortunently for me the best doctor and anateialogist in the State were called in to perform my appendectomy. We had only walked into the doors about 3 hours before and they were wheeling me in to surgery. My brother, never being a person to miss a joke, gave me a, “if I never see you again….” joke. I was a little scared so while I laughed I didn’t paricularly appreciate it. My racing goals changed there: instead of beating my brother it was now to pass gas and pee as fast as possible to get out of there and watch my brother race. I was told I could be out of the hospital the next day if everything went well. Well everything did not go perfect for me. My body had a difficult time whipping back in to shape. I got the passing gas thing down, but hey needed me to urinate to show I was not retaining water. Either by body knew I was supposed to be swimming or it really liked that hospital water, my body retained water like a champ. After not being able to urninate on command the doctors decided to hold me one more day, which meant I would miss my brothers race. We have been gaining some popularity and followers along with a little coinfidence so we thought we would go to our first out of town event. 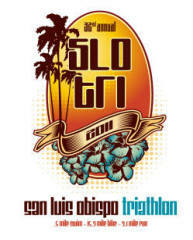 The San Luis Obispo Triathalon. This event sounded exciting, it was a modest sprint triathalon, it was a staggered start because everybody started in a Pool at the SLO swimcenter, the bike took the racers on to Orcutt Road which we were told is a country road with near the busy San Luis Downtown and the run was arround local streets infront of French Hospital and other neat San Luis sites to Sinsheimer Park Baseball Stadium. The event was held last Sunday on July24 and we were excited. This was our first normal triathalon (the Race at the Base was a backward sprint triathalon) so we were interested to see how we would do with the swim (our worst event) being first. The friday before I got of work, meet my brother and we packed his truck with our bikes, helmets and other gear and started on the scenic 4 hour drive out of LA and up the Pacific Coast Highway. As a family we used to make this trip every year to visit my Dad who runs the CSPA workshop our of Cal Poly San Luis Obispo, and other family members who live in the city. SLO is also where we started our training program only a few months ago. So to find out if SLO was slow, fast, or other to us… stay tuned…. Fathers Day is coming up and it’s time again for the running brothers to go on our annual father-son golf trip. This year we are heading up north to the Oxnard area to play at River Ridge Country Club. We are excited to see a new town, play some golf but most of hang out with our Dad. The Running Brothers are returning to their roots. We started our running in one of our favorate Cities, San Luis Obispo. You can read our previous running advantures in SLO, all the way back in December. That was our first real training day and I think we have come alot. Now we are going back for our second triathalon. The 32nd Annnual SLO Triathalon will be on July 24, 2011 and the running brothers will be there ready to run, bike and swim. You may have read that our family has a pretty close connection to San Luis Obispo. Our mother grew up in SLO, our father attended the California Scholastic Press Association Workshop and subseqently lead for work show for nearly 30 years. Our parents meet at that workshop at the California Polytechnic University, San Luis Obispo. My brother, Sister and I all attended the workshop. Our family made regular trips to SLO to see our family. So needless to say SLO has a special place in our hearts. If you want to join us let us know, if you want to make the drive or are a local and want to cheer us on that would be fantastic. Our recent post about skin care may lead you to think, well as long as I wear sunscreen I am doing everything I can. 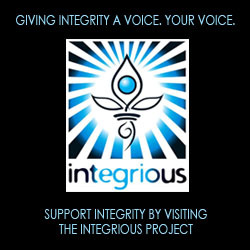 Well… there are more options that I have found and I hope you can help to provide some more. Sunscreen: Everyone knows about sunscreen. 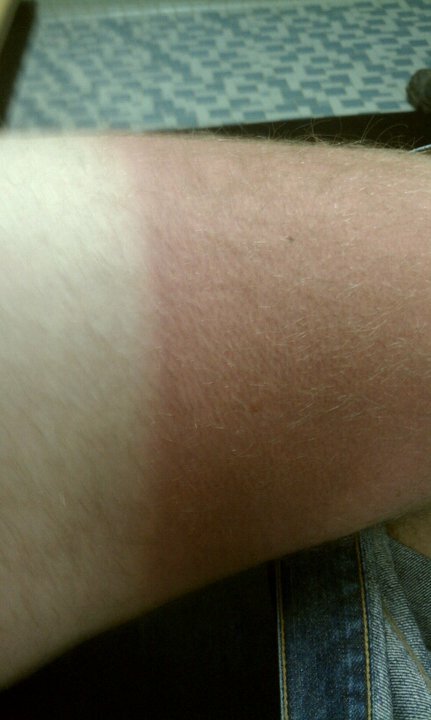 I have found that anything above SPF 30 doesn’t do much more for me than the lower SPF stuff. I really like the new spray sunscreens because they don’t run in to my eyes and dont make my hands feel slimey. Protective Clothing– Several companies specialize in sun protection clothing. They have come along way it not just long cotton sleeves, these shirts are sophisicated. Coolibar is a company that specialized in sun pretective cloathing. I only have one Columbia shirt that is meant for sun protective athletes and I really like it, it breathes great and I look pretty good in it. But now that I know about Coolibar I think that would be a good recommendation when people ask me what I want for my birthday. Apparently, they even have swim sunprotective clothing. Us pale skinned folks thank companies like Coolibar. Laundry Detergent– Some companies are making an additive to add to your laundry to increase your clothings sun protectiveness. CRAZY! I have never tried this but it sound interesting. What other methods do you have for protecting your skin, can you provide our readers with some other options?